Over the years I've written quite a bit about the Gwangju Uprising, the way it has been remembered, and the movies and literature which have depicted it (an older summary of posts is here). It has been depicted in movies such as A Petal (꽃잎, 1996), Peppermint Candy (박하사탕, 1999), The Old Garden (오래된 정원, 2006), May 18 (화려한 휴가, 2007), 26 Years (26년, 2012) and now a new film, A Taxi Driver (택시운전사) has just been released. As the New York Times has reported, the film stars Song Kang-ho and tells the story of the taxi driver known as 'Kim Sa-bok' who drove German reporter Jurgen Hinzpeter to Gwangju twice during the uprising, first on May 21 and 22, when he filmed the aftermath of the mass shootings on May 21, and the second time when he returned for the final days and suppression of the uprising. (His footage of the suppression's aftermath can be seen at the beginning of A Petal.) The taxi driver has never been found or positively identified, however. Here's a shot of Jurgen Hinzpeter (which I first posted here) when he revisited Kwangju in the mid 2000s; he's in the gymnasium across from the provincial hall in Kwangju. 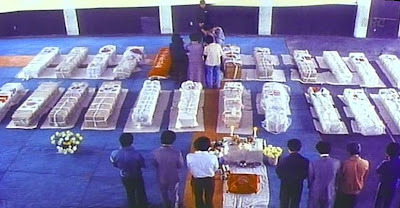 It was there that he shot the footage captured below of the coffins of the identified dead in 1980 (far more were still in hospitals at that time). He was later severely beaten by plainclothes police in 1986 while covering a rally, possibly in revenge for the footage he filmed in Kwangju. His injuries ended his career. One hopes the taxi driver, whoever he was, fared better.